MAINZ/FRANKFURT (Reuters) - Germany's auction of spectrum for 5G mobile networks drew brisk initial bidding on Tuesday with prospective new entrant 1&1 Drillisch submitting bold offers for the frequencies it covets. Drillisch, run by maverick tycoon Ralph Dommermuth, is vying to become a fourth operator in Europe's largest economy - a move that could benefit consumers but pressure the margins of the three existing players. It made the early running in the auction being held at a former army barracks in the southwestern city of Mainz that, according to results https://www.bundesnetzagentur.de/DE/Sachgebiete/Telekommunikation/Unternehmen_Institutionen/Frequenzen/OeffentlicheNetze/Mobilfunknetze/mobilfunknetze-node.html posted online, had raised a total of 314 million euros ($357 million) by lunchtime. Drillisch, majority owned by United Internet , put down a marker in the first round by staking more than 20 million euros apiece for 10 of the 41 blocks of spectrum on offer. By contrast, the three existing operators - Deutsche Telekom, Vodafone and Telefonica Deutschland - only submitted minimum opening bids for the blocks they are interested in. The auction only went ahead after a court last week threw out lawsuits from the operators, who had complained that a requirement to provide high-speed coverage to 98 percent of households by 2022 was too onerous. The four firms are vying for spectrum in the 2 GHz and 3.6 GHz bands - the latter particularly suited to running 'connected' factories, a priority as German exporters seek to remain competitive in the digital age. 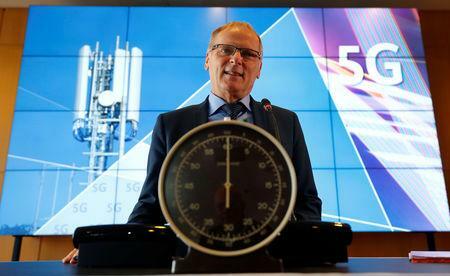 Dommermuth, a self-made billionaire, has lined up 2.8 billion euros in financing to back his 5G ambition, suggesting there could be fireworks in the auction after Germany's last one, in 2015, raised 5.1 billion euros. Yet despite his striking entrance, analysts don't expect bidding to get out of hand - as it did in a ruinous 3G auction in 2000 that raised 50 billion euros, forcing some players to exit the German market and others to merge. "The only reason for high auction prices ... will be a senseless strategy to block 1&1 Drillisch," said Berenberg analyst Usman Ghazi. He said that would be futile because Drillisch, which now runs a 'virtual' mobile network, already has guaranteed access to Telefonica's network under conditions attached to its merger with E-Plus five years ago. Most of the national 5G auctions held in Europe to date have been low-key, low-cost affairs. The exception was Italy, where fierce bidding last year generated proceeds of 6.5 billion euros and left operators financially stretched. In Mainz, further auction rounds saw intriguing duels developing, as Vodafone outbid Drillisch on two blocks and Deutsche Telekom on one. Most of the other blocks languished at or near reserve prices, ranging from 1.7 million to 5 million euros, as teams hunkered down for a campaign that could last several weeks. Participants had to surrender their smartphones on entering the BNetzA branch. Isolated in separate rooms to prevent collusion, they are bidding on a secure network and can only request guidance from head office via fax. "We are happy that it's getting under way - it's been a bumpy start and could have happened earlier," said Deutsche Telekom spokesman Philipp Schindera. Regulators also clarified ground rules applying to network equipment vendors following U.S. pressure on its allies to ban China's Huawei Technologies on national security grounds. Germany opted instead to impose tighter compliance requirements on all vendors, creating a level playing field and allaying the concerns of the operators - all of which already use Huawei equipment - that they would have to replace parts of their networks at great expense. "Our approach is not to simply exclude one company or one actor, but rather we have requirements of the competitors for this 5G technology," Chancellor Angela Merkel said on Tuesday in Berlin, explaining her government's position.